A new Swirl-way® Combination Whirlpool and Air Massage Bath System have been launched that combine the luxury of having a tub with both whirlpool jets and an air massage bath all in one easy-to-use system. Available in 13 models, this bath system includes the Hydro-V backjet system, an inline heater, fully-adjustable jets, chromatherapy light system, ozonator and multi-function electronic keypad. – Inclusion of an ozonator as a standard feature of the Swirl-way® Comfort Package whirlpools and the Combination systems. The ozonator automatically emits bacteria-killing ozone into the whirlpool piping system twice every 24 hours. The ozonator is also available as an option on the Swirl-way® Essentials Package whirlpools. – New draining options for Swirl-way tubs include a Tip Toe Drain that provides fast and easy draining by simply tapping the drain with your toe to open or close the drain. Or, an effortless twist operation is available with a Cable-Operated Drain. Both are available in Chrome, Brushed Nickel, Everbrass or Oil Rubbed Bronze. – Flush mount air injectors are now included in the construction of Swirl-way Air Baths. 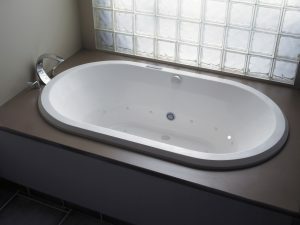 Air is forced through the air injectors which are installed on the back wall of the tub. Each air injector has a check valve that prevents water from flowing back into the air line.